Sew what's cooking with Joan! : Cilantro Margarita! Today, this jet setter is in Mexico! Yes, I'm here in Cabo San Lucas with Wee Bear and a few of his fraternity brothers who visit each year. This year is the 10 anniversary of their get together which started right here in Cabo, when Wee Bear and I lived here. Last year, when they came to visit us in our Scottsdale home, I asked if they wanted to return to the scene of the crime? Yes! Yes! and Yes! So, I traded into four condo's on the beach in Cabo! Here is the view of the arch and beach from our condo! Pretty cool! The other night we were dining with some dear friends who live here in the Winter. 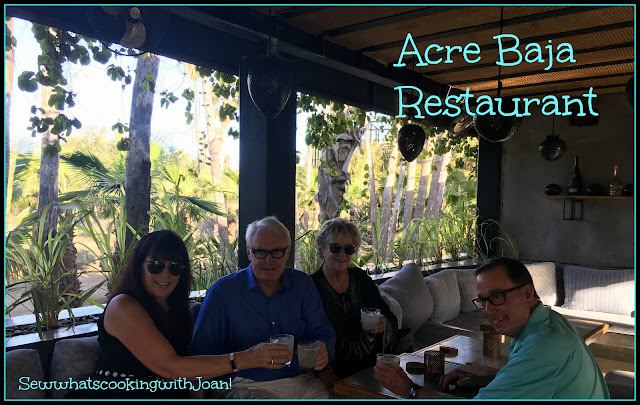 We dined at a fairly new restaurant in San Jose, Acre......fantastic! The food, the atmosphere and the hand crafted cocktails are over the top! The four of us decided on a Sabio Sour made with Reposado Tequila, Triple Sec, Lime and Sage Syrup, which is made in house. 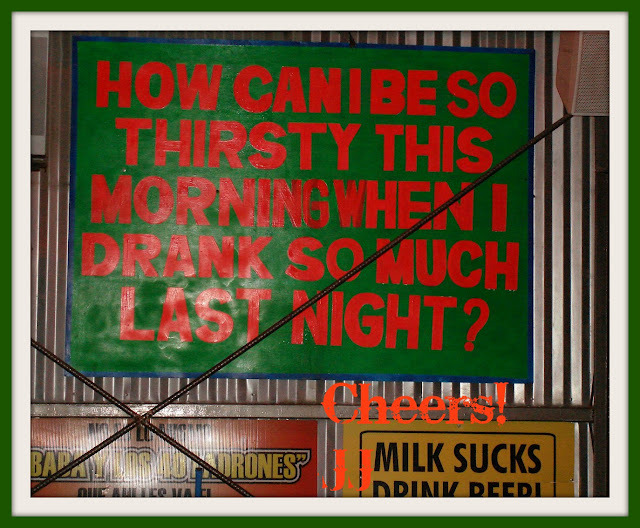 The best margarita I have ever laid my lips on! OMgosh! Not sweet, just the right amount of sour......mmmmmm this would be delicious with my rendition of Cilantro Lime Tacos. For dinner I had the Whole roasted chicken pictured below, moist and flavorful, comes with a basket of steamed buns and is delicious! 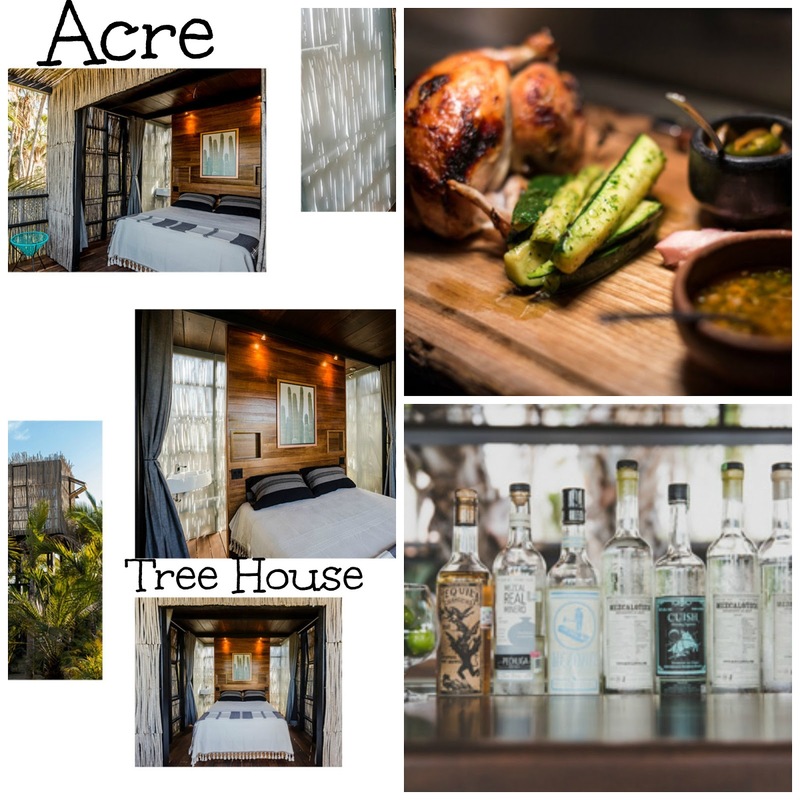 Acre also has tree houses available to rent! Fun times! For more info go to the Acre Baja Restaurant Website. 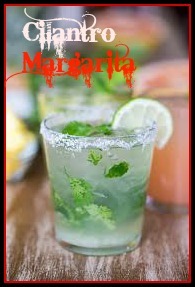 In honor of the day, here is my recipe for a delicious Cilantro Margarita that I think you will like! 1. Rub rim of a margarita glass with lime wedge, and dip in salt, if desired. Fill glass about half way with cilantro sprigs. 2. Place ice cubes in a cocktail shaker; add tequila, Cointreau, lime juice, simple syrup, and remaining cilantro sprigs. Cover with lid, and shake vigorously until frosty and thoroughly chilled, 15 to 20 seconds. Strain into prepared glass. Garnish with lime slice. Queso Fundido Wee Bear favorite! We had this last night on the beach!